As a kid in junior high and high school in Tampa, I had no choice. 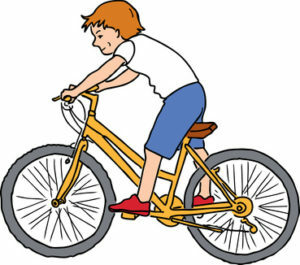 I peddled my bike to school and back, to visit friends, go to the movies, etc. until I was old enough to land a part time job at a Kwik Chek Grocery store and buy a car and liability insurance, a luxury my widowed mom could not afford to provide me. All my life, I’ve used bikes in places I’ve lived, particularly in Belgium, another flat landscape that lends itself to two wheelers. The last place we lived before moving to Amelia Island was Atlanta, which is not bicycle friendly due to its many hills and awful traffic. But here in Florida because of its climate and flat topography, the state should be ideal for cyclists. But it’s not. Florida has a reputation as the most deadly state in America to cycle with Tampa-St. Petersburg being the most deadly community for cyclists in the country followed closely by Jacksonville. According to statistics from the National Highway Traffic Safety Administration Florida had by far the highest per capita bicyclist death rate in the nation with 6.2 percent per 100,000 people killed from 2007-16. That’s 59 percent higher than Louisiana, the state with the second highest numbers. The Tampa-St. Petersburg area leads the state with a staggering 7.0 per 100,000 followed by Jacksonville at 6.0, making them the two most deadly places in America to hop on a bike. A friend of mine, Fran Kane, currently moving here from Tampa, related a story of how — when riding a bike on Tampa’s Davis Island — he was whacked and critically injured by a car driven by a distracted nun. It took him more than a year of therapy five days a week and major spinal surgery to regain the use of his right arm. He still can’t throw a ball overhand and continues to suffer chronic pain. The nun even made mention of the incident in a book she wrote following her retirement. 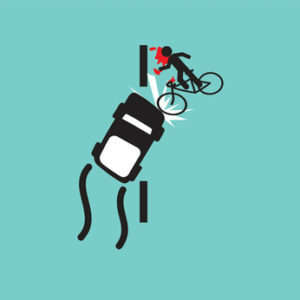 As a kid I had two bicycle accidents that I can recall, one running smack into the door of a car the driver had just opened on the street side and the other landing in the bottom of hole at night that was dug by a road crew that day and not clearly marked. I wasn’t seriously injured in either but they didn’t do the bike any good. My bicycle excursions here mostly amount to riding from my Seaside home down Jean Lafitte, Jasmine and Citrona to the YMCA and back, and rides downtown or to the beach. The only time I’ve been nervous is recently when the town began repairing the sidewalk along Citrona and I’ve had to ride in the street. It makes me very uneasy peddling along Citrona, particularly when Fernandina Beach High School lets out and young drivers are tempted to text while heading home. If a nun can be distracted then how easy is it for a 16-year-old to do the same? According to the National Safety Council, driver distraction, particularly texting is a major problem. Alcohol consumption both by drivers and cyclists runs a close second. I know of two local incidents where bicyclists have been stopped by the police because they were drunk. One was warned and told to walk his bike home, while the other, who was found passed out next to his bike on the side of the road was hauled to the slammer. Police hereabouts take bikers seriously and do what they can to prevent accidents. My wife, Linda, was stopped on a ride through Ft. Clinch and told to take her ear buds out as they prevented her from hearing traffic coming up behind her. I agree. She couldn’t even hear me when I hollered at her to stop or turn. It is also required for bikers to use lights here at night, which I also strongly agree with as I’ve had bikers with no lights, clad in dark clothing swerve across my car’s path on a couple of scary and close call occasions. Even though I am a biker my pet peeve is those who ride two or three abreast so they can chit chat as they peddle along, particularly on Fletcher Avenue. I don’t want to mention a car-bike accident in my book years from now. The Florida Department of Transportation is taking a number of steps to improve the safety of bikers with better street lighting, wider bike paths, and educational programs, etc. But through the end of September 97 cyclists have been killed putting the state on track for about 133 bicycle-motorist deaths this year. Maybe It Was A Full Moon: This is very funny. It’s also true. And I didn’t make it up, honest. Fernandina Beach City Commissioner, Mayor, and Palace Saloon bartender, Johnny “Moonbeam” Miller, announced on his personal Facebook page last week that he intends to run in 2020 for the 4th U.S. Congressional District seat currently held by Republican Johnny Rutherford. Bartender/Mayor Miller didn’t say what party he is affiliated with, where he expects to get the necessary funding, who is endorsing him, or who will be on his campaign staff in this hopeless Quixotic quest. If nothing else, his campaign, — if by some miracle it actually materializes — will enable all 778,000 residents of the 4th District, which encompasses Nassau County, a large part of Jacksonville’s Duval County and south to St. Augustine in St. Johns County, to chuckle at our local joke of a politician. The district, which is majority Republican, has voted overwhelmingly for every GOP candidate, presidential and otherwise, since 1992. Republicans would react to Moonbeam’s candidacy like Linda Blair’s Exorcist character’s did to Holy Water and I can’t imagine even the far left wingers, even those in crazy Uncle Bernie’s asylum wanting to be associated with this tree-hugging fanatic. I suspect the gasps and laughs will come fast and furious when the folks opening the door to his closet are buried in skeletons that will prove too embarrassing and impossible to explain away. “It has come to my attention that Johnny Miller, mayor of Fernandina Beach and bartender at the Palace Saloon, has announced his candidacy for representative to Congress for Florida’s Fourth District in 2020. Mayor Miller said his inspiration was Senator Flake’s flip-flopping on the Brett K. Supreme Court nomination. His push was the far left’s outstandingly disgusting and systematic destruction of a man’s good name and family. Setting aside the left’s obvious hypocrisy and lunacy on this matter, the absolute circus the Democrats made of this process is downright shameful. If we are to believe every allegation made by anyone at any time, where is the leftist outrage at Senator Booker’s alleged battery and those other Democrats sitting on the Judiciary Committee? Miller will have no reasonable reply to that, nor will he understand the hypocrisy. It didn’t take long for Mr. Smith to sum up Mayor Moonbeam and I agree with his assessment. If Moonbeam is actually serious, there will be so much more and it will be so much fun. However, it must be gnawing at him why he shouldn’t attempt this preposterous leap. Is he willing to put himself and his family up for ridicule, because he knows what’s in that closet of his? The late David Yulee and downtown’s Peg-leg Pete statue have about the same chance of being elected as Moonbeam, and are both far more qualified. Unintended Consequences Department: Ironically the real losers in the Democrats handling of the disgusting Brett Kavanaugh Senate Confirmation Hearings were women. For years they have been fighting for their legitimate rights. And just as they were on an equal footing the Democrats, extreme feminists, and far-left fanatics took a sledge hammer to those hard-won rights with their vile and repulsive handling of Judge Kavanaugh and their abuse of a sad and pathetic Christine Ford. Women have rightfully demanded to be included in business dinners, cocktail get togethers, and other events and to be treated socially equal in business. Now, businessman around the country will think twice before inviting a woman to a company dinner or cocktail event where business relationships are made and deals done. They, and #Me Too, are far worse off today for this, than before the hearings. The Democrats acted unethically, and in violation of all due process and confidentiality. And they destroyed Ms. Ford in the process. Her life will never be the same again. Her kids just like Kavanaugh’s daughters, will suffer. The Democrats think the American people are stupid and in this case they attempted to put all 63 million Trump voters in Hillary’s “deplorable” basket. 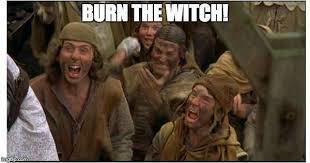 In doing so they made a terrible miscalculation and I predict they will pay dearly in the November elections for their willful and shameful treatment of Ms. Ford and Judge Kavanaugh, during a vile spectacle that set the rights of all American women back for many years and sealed the reputation of the Democrat Party as a group of radicalized, dishonest, hateful, guillotine-blade sharpeners led by a doddering, demented, hypocritical, lying Senator Dianne Feinstein, a cross between Eva Braun and Marie Laveau. A bugged-eyed, crazed and confused Cory Booker, empty skirt Kamala Harris, and serial liar and deceitful stolen valor loser Richard Blumenthal are topics for future discussion as are the other shrieking, spittle-flecked Democrat members of the Judiciary Committee. Also, at this point a self righteous, shaken and cowardly Republican, Jeff Flake, may already have been fitted for a straight jacket and confined to an institution where he’s required to eat without access to any sharp objects. Former astronaut Bill Nelson lost in space. 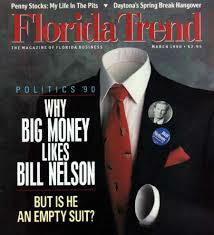 Who Is Bill Nelson? In his “American Spectator” column yesterday, Thursday, Oct. 4, friend and former Tampa Plant High School classmate Larry Thorneberry, drew stark comparisons between Florida’s senatorial candidates Republican Governor Rick Scott and Democrat Senator Bill Nelson and gubernatorial candidates Jacksonville area Republican Congressman Ron DeSantis and Democrat Tallahassee Mayor Andrew Gillum. Drinking, Dining & Dancing: Next Saturday, October 13 Main Beach will be filled with smokers, the smell of pork and brisket barbeque, and the sound of music, during a cancer cure fund raiser. Some 400 plates of pork and brisket plates will sell for $10 with offerings from more than 50 of the area’s best pit masters. Proceeds of these sales will be donated in the name of Gary Lee Park Jr and his late wife Joy Smith-Park, who lost her battle with cancer this year. Live music from Decades Band and The Honey Badgers will be heard from 11:30am – 3:00pm. “Protecting Amelia island’s Dunes; Protecting Island Residents” will be the topic at 6:30 p.m. at Story & Song, 1430 Park Avenue at 14th Street, Wednesday, Oct. 17. The event is sponsored by The Amelia Island Beach and Marine Life Protection Task Force and features speaker: Frank Hopf – PhD, PE (Texas), PhD, Geomorphologist (look it up folks) who will explain dune formation, the habitat dunes provide, how they protect residents during hurricanes, and the human activities that threaten them – and island residents. Beer and wine will be available for sale. If you’re looking for a few chuckles and a cocktail then you’ll want to be at St. Peter’s Burns Hall at 801 Atlantic this coming Thursday, October 11 for the 5th Annual Storytelling Slam. The event features a cash bar and five of the area’s best “storytellers” telling their stories as they compete to see who can generate the most laughs. Tickets for the Cafe Karibo-sponsored reception are $50 and can be purchased at the Fernandina Beach Library at 26 North 4th Street or online at www.FernandinaFOL.org or by calling 904/530-6500. All money goes to Friends of the Library for the newly renovated library. My most memorable bicycle tale is a bit gruesome. Living in Waycross GA when I was about 7 years old my older brother and I rode our bicycles down 1/4 mile down to a little creek. My fishing pole was a bamboo cane about 4' long with a piece of fishing line and hook attached. Our bait was a pinched off piece of off-brand hot dog. Lo and behold, I caught a fish - all about 4" long. So excited and no way to carry the fish home, I jumped on my bike and started to ride home to show my parents of my amazing catch. About a block from home, the harmonic rhythm of my pedaling had the dangling fish oscillating back and forth. Yep, you guessed it, right into the spokes of my front wheel which disintegrated the fish and broke the line as it wrapped around the reel. Never another fish caught in that creek in the years since. While I disagree with Sen. Bill Nelson on many issues, he has been a strong friend of Fernandina Beach with regards to the US Post Office restoration. In addition, during the Iraq & Afganistan wars, when there was a casualty of a north FL solider, he was always there at the Jacksonville airport or the funeral home to honor the fallen soldier and his family. Never any speeches, just private words with the family and coming down the flag line to thank all of us for coming out and supporting the family. I will always be grateful for his taking the time to do that. Thanks for bringing this situation/topic up. Cycling was how we got from point "A" to point "B" growing up in NY. We had one car and dad took that to work. It became a lifelong pursuit even to the extent of owning bikes shops after retiring from the tech world. The media was only interested in covering the cycling dangers in Tampa immediately after the latest fatality, of which there were many. I did many a segment for the local network news organizations displaying a 3 ft orange flag off the left side of my handle bars. It represented the distance that a vehicle by law in Florida must give a cyclist when passing. Yes, even if they are in the bike lane. Sadly most municipalities are not aware of this state law and it is never enforced. For the record an individual on a bicycle has as much of a right to the road as someone That is distracted driving a motor vehicle. Sadly the cyclists always loose in these encounters even though the were "dead right..."
When we were youngsters, we rode bikes because they opened up a whole new world of exploration and freedom. And as a newfound form of transportation - other than walking - they allowed us to go riding with friends, seek out new places and show off for girls/boys. Bikes had a real purpose and were a source of independence. Today, a "strange" group of people buy body hugging, outlandish clothing, shoes that look like they belong on sugarplum fairies and strap their feet to the pedals. They then gather with other strange such people as a group (usually at some local cycle shop) and flow like lava onto heavily traveled roadways in a show of vulnerable force and stubborn determination to claim their "God given right " to share the road with a 2,000-pound missiles traveling at 50-plus miles an hour. And occasionally there's the biker with an attitude who will not yield to motorists, thereby mucking up traffic flow. Automobiles run into each other all the time. Is is surprising that they sometimes run into a bike or two? If these nuts on skinny little wheels don't want to get hit by cars, they should stay off highways and limit their folly to bike trails and designated areas that don't pit them against cars. Footnote: An overwhelming majority of the "serious/dedicated" road-bound bikers I know are liberals. Makes sense! I think Dave is all wrong............Moonbeam Miller is fine. He's the kind of "amateur politician" who will do no harm......he doesn't do anything! (Kind of reminds one of Bill Nelson). Great! Rock on Moonbeam. Dave, great blog. Just wish us readers could get peek at your political views...Regarding the biking dangers in Fla, offering up your favorite route may have been a bad idea. Now all your “biggest fans” need is the time of day...hope you have both large mirrors and razor quick reactions! See ya downtown! Mayor Miller will have little chance of defeating John Rutherford. Mr. Rutherford was a popular Sheriff and the majority ,of voters still support him. Millet is a carbon copy of everything dysfunctional in Washington. This will be brought out in any campaign he chooses to run in that includes any voters outside of Fernandina Beach. 15-20 years ago we didn't need bicycle paths because the traffic here was so light. As more and more people move to "paradise" the dangers increase for the bikers and the motorists. 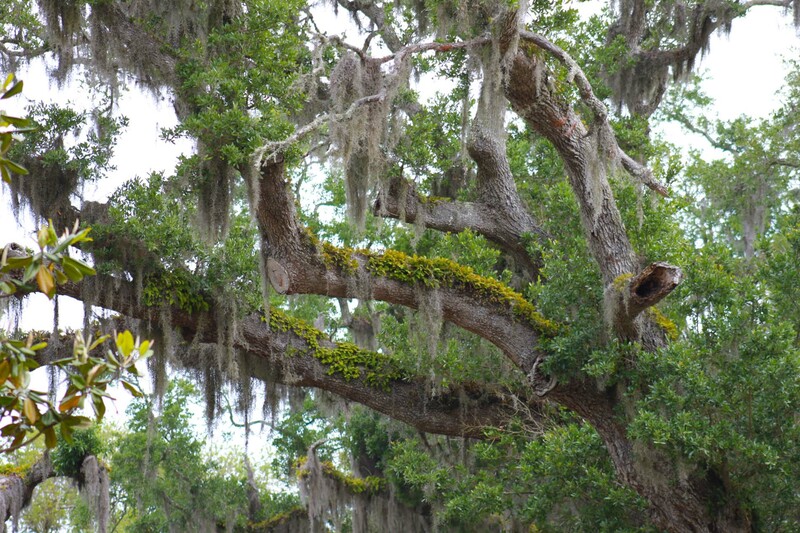 The Amelia Island Trail (and other bike paths) are very helpful for safety and convenience but are not a total solution. A day or two ago I opened the door for a woman (stranger) at the Flash Food store. As she walked thru I thought to myself, "Oh hell, did I just do something wrong?"